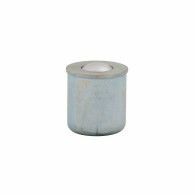 Where flush type oilers are desired, the Style GB with ball valve opening provides durable, easily assembled protection requiring minimum top clearance. The easily depressed ball valve (music wire spring) instantly closes when pressure is released. No. 520, 521 and 522 are constructed with steel balls (Cross Section No. 1). All others feature bubble closures (Cross Section No. 2).